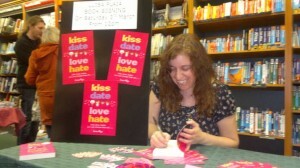 There’s a lovely review of Kiss Date Love Hate written by a young reader in the Guardian: Guardian teen book reviews. And Booktrust has reviewed Swapped by a Kiss and Kiss Date Love Hate. Thank you very much to Booktrust and the Guardian! Meanwhile, I’ve been posting at the Random House blog about my book signing, and telling Girls Heart Books all about my computer nightmare.